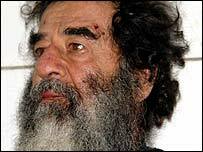 The bloodless capture of Saddam Hussein has given the American and British governments a big boost. It has also given new hope to the people of Iraq who feared his regime might one day return. This is a historic turning point for modern Iraq. Saddam Hussein's capture marks a huge morale boost for US forces and a serious blow to Ba'athist elements engaged in armed resistance against them. It provides a significant political boost for President George Bush and for the British Prime Minister Tony Blair who were both coming under ever stronger criticism for launching their invasion of Iraq as the casualty toll mounted. But above all the capture of Saddam Hussein marks a huge opportunity for the Iraqi people. This is the definitive end of the Ba'athist regime. There can be no succession. Saddam Hussein is in custody and his two sons who were major props to his regime are both dead. This does not mean that armed resistance to the Americans and their allies will end.